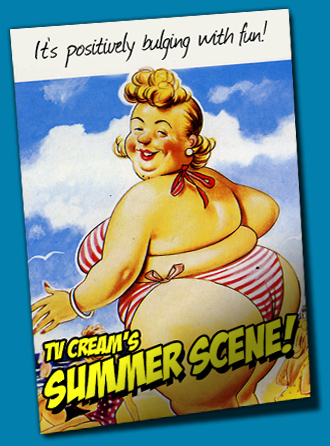 Just in time for the arrival of autumn and Mr Kipling’s season of mellow fruit pies, TV Cream’s Summer Scene is here. Yes, a whole eight Georgian calendar months since the last podcast, the chaps have finally slung together an audio hamper ready for you to unpack, nibble and find slightly discomfiting over the bank holiday weekend. Except in Scotland, where summer ends on Sunday, not Monday. So what does the latest Scene contain? …these are just some of the things you won’t be hearing, in this or in any TV Cream podcast. What you can expect is someone in the first 90 seconds telling you what you can expect in the subsequent 2,258, followed by around 39 minutes of freshly-hewn sun-dried Creamage comprising stories, songs and squabbling. Plus the noise of a bee nicked off The Jam’s Sound Affects. You can listen to TV Cream’s Summer Scene in three ways. Secondly, you can use our Podcast! player in the right-hand sidebar. Third, you can listen to it right here by clicking the play button below. However if you’re of a particularly sensitive disposition, you might want to apply some kind of protection behind your ears as well as on the backs of your knees and the bridge of your nose. Happy listening! Its been reported that Simon Dee has passed away. Indeed. Sad news. As immortalised in the Benny Hill sketch ‘Tupper Time’, of course. Anyway, great work lads. Good to hear the fruits of your labour once again! And look, it’s available on a BBC single. I love the way Mr Michelmore swings around his swivel chair at the start – decades of Lime Grove experience, there. Excellent work by all – loving the jingles (particularly the one about your brother burning your comics), and the features were all great, but – pray tell – why wasn’t there an Ian Jones-helmed item? Can we hope for more Ian antics in the sci-fi scene? There I was, just finishing my mediocre lunch with nothing to get me through a boring afternoon and now this… How amazing! Thank you so much, guys. You’ve made me VERY happy! By the way, what does one call a member of TV Cream’s fanbase? Creamies? Creamers? Personally I love Simon May’s 1986 Holiday theme better than ‘Heartsong’ but y’know. Even if most of his themes around that time were strings and piano belted out on a synthesizer! Now they just send Chris Moyles out with a big top and Lily Allen, can’t they do anything right! Smiley Miley should be at least allowed on stage!